If your future includes a move to Buena Park, check out Meathead Movers! Our professionally trained student-athlete movers, moving concierge, and princess packers are prepared to get you safely moved into your new Buena Park home. When you make your move to Buena Park, be sure to contact Meathead Movers. No matter what type of moving service you need, our student-athlete movers are ready to handle all your moving needs. Beautiful Buena Park, California, boasts some of Southern California’s most exciting recreation venues. The city prides itself on being the Center of the Southland and is conveniently located adjacent to Interstate 5, also known as the Santa Ana Freeway. Families and retirees moving to Buena Park will enjoy the area’s many attractions and laid-back pace. 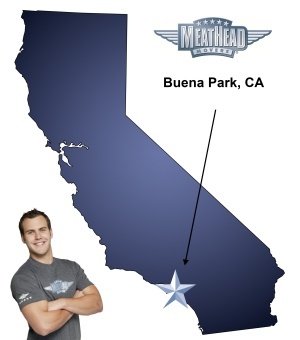 At Meathead, we pride ourselves on being your Buena Park movers of choice. There are plenty of attractions and activities for everyone in Buena Park. Residents who are hungry for adventure can enjoy an entertaining meal at Medieval Times. Families and couples alike can enjoy Knott’s Berry Farms, one of Southern California’s oldest theme parks. Beach Boulevard, the city’s main thoroughfare, plays host to a variety of restaurants and shops. During hot summers, families can cool off at Knott’s Berry Farm’s Splash City, one of the area’s largest water parks. Buena Park is also home to the Ralph B. Clark Regional Park. This major park has a variety of trails and a fishing pond open to the public. Educational and entertainment events are held at the park’s amphitheater. The generally temperate climate of Buena Park allows residents to enjoy the park and other outdoor attractions year-round. As your Buena Park movers, we will be sure to deliver all your possessions to your new home safely and on time. Our moving company specializes in local, long-distance, and commercial moves to, from, and within Buena Park. We also provide reliable packing, storage, on-site relocations, and our distinctive moving concierge service. Our movers are all clean-cut, friendly and 100% drug-free student athletes. You can trust our movers to take care of your precious possessions. Our office staff also uses a proprietary software system to ensure that your move goes off without a hitch. Our Princess Packers are available to assist with the pre-move process by carefully packaging you’re your most fragile items. Having your belongings packed for you can save you time and worry. To maximize the speed of your move and save you money, our student-athletes jog when not carrying your possessions. We pride ourselves on providing great customer service and having a breakage-to-move ratio which is eight times less than the national moving industry standard. You can rest assured knowing that your possessions are being handled by the best in the industry. Moving to Buena Park should be an enjoyable experience. You can trust Meathead Movers to take care of your moving needs every step of the way. Contact us today for a free no-obligation moving quote. Our Buena Park movers are ready to make the transition to your new home as smooth as possible. Moving to Buena Park? Here are some helpful resources. View more Buena Park resources. The movers could be a little more careful with the items like not having the boxes upside down when moving them. The workers were friendly, efficient & aimed to please. They made the move a smooth transition. Awesome. The guys were on time and smiling. They were extremely pleasant and efficient. I felt comfortable the entire time from start to finish. Thank you so much for making my move so stress free.